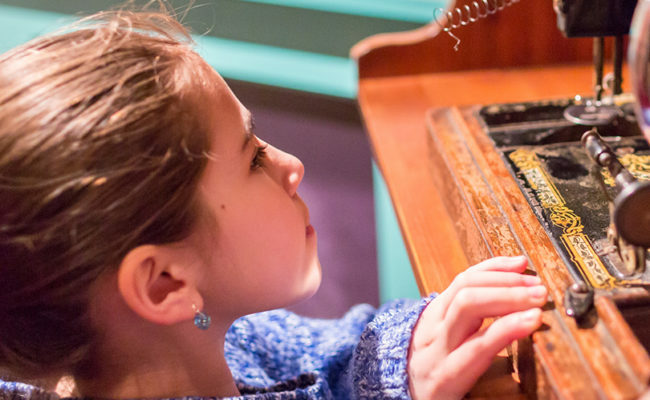 Check out our list of unmissable things to see and do in the permanent displays at the Jewish Museum London. Visiting as a family? Then check out our fun Family Favourites. 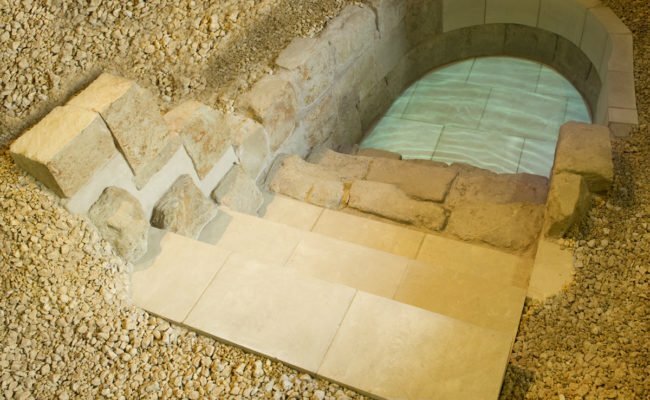 A mikveh is a bath used for ritual cleansing in Judaism. This one was excavated in the basement of a house in the City of London and is one of our oldest objects. It has been reconstructed to look similar to when it was first discovered by archaeologists. 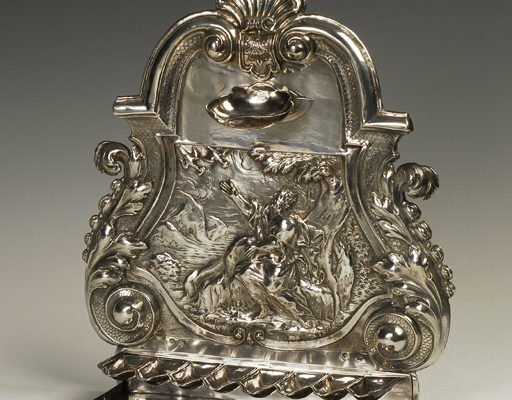 This rare and exquisite silver Hanukah lamp was made to mark the marriage of Elias Lindo to Rachel Lopes Ferreira. The Lindos were prominent members of the early community of Spanish and Portugeuese Jews in London and founder members of Bevis Marks Synagogue. 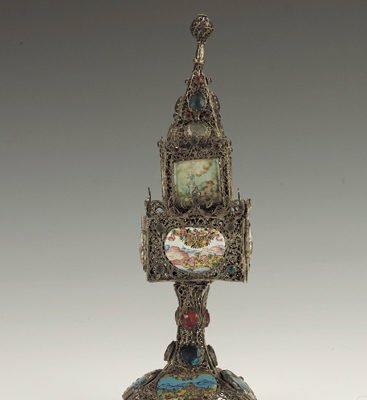 Known as the Lindo lamp it is the oldest example of a Hanukah lamp made in England. This colourful and unusual mid-18th century spice tower is one of only eight spice towers made in Schwäbisch Gmünd, a German town famous for its metalwork. Miniatures on the enamel plaques depict landscapes, figures and biblical scenes. This stunningly beautiful, carved, coloured and gilded synagogue Ark is probably Piedmontese. It originally held the Torah scrolls in a synagogue. 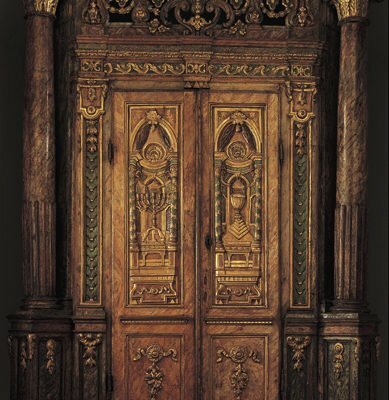 For many years it was used as a cupboard at Chillingham Castle until it was discovered at an auction and purchased for the museum. 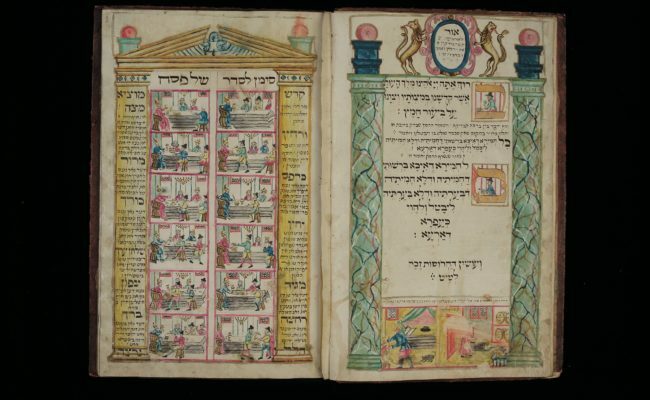 This Haggadah tells the story of the Exodus of the Jews from Egypt and is read at Passover. This beautifully illustrated example was made by a scribe named Abraham of Ihringen. It is illustrated with water-colours which make use of a huge range of colours, especially the pastel shades. All illustrations are captioned with Yiddish rhymes. Daniel Mendoza was a Jewish boxer who became known for his ‘scientific’ style of boxing at a time when bare-knuckle boxing was extremely popular. 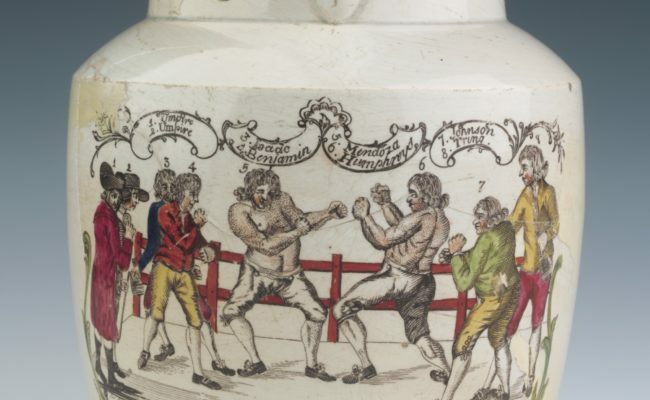 This jug made by John Aynsley in Stoke-on-Trent depicts Richard Humphries and Mendoza fighting at Odiham in Hampshire on 9th January 1788. This plate commemorates author Israel Zangwill’s robust response to a heckler who described him as ‘an alien Jew’ at a public meeting in Kingsway Hall. 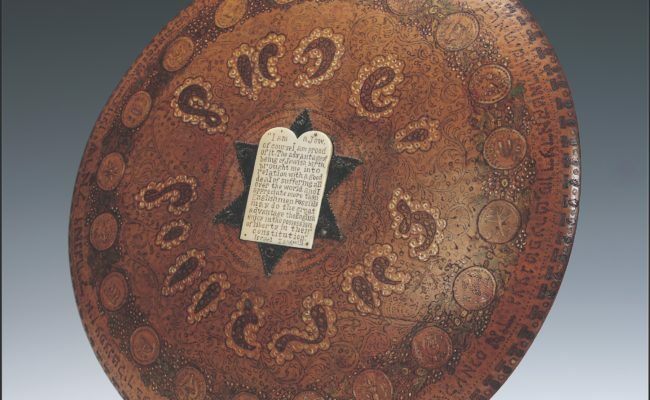 Morris Myer, editor of one of the main Anglo-Jewish Yiddish newspapers, commissioned artist Lazar Berson to make this plate. Many Jewish immigrants who came to Britain in the late 19th and early 20th century from Eastern Europe and Russia ended up working in the tailoring trade. In our interactive workshop you can feel the weight of the tailoring scissors and irons and learn about this popular profession. Doris Benjamin joined the Voluntary Aid Detachment in 1944. 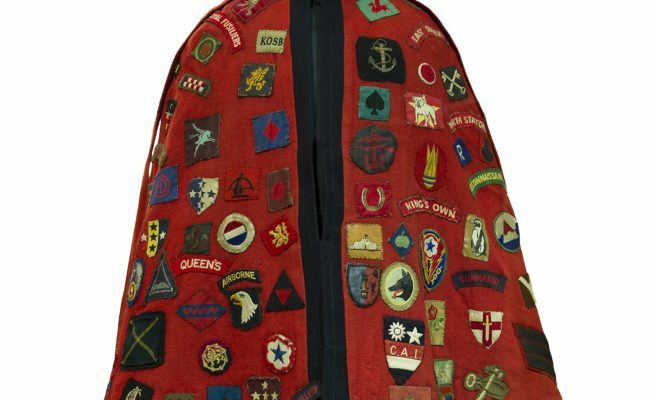 Working in two military hospitals during the Second World War she collected over 160 regimental badges from the soldiers she treated and attached them to her colourful cape.